HALE means “house” in ‘ōlelo Hawai’i. The HALE Program, established in 2014 by the Department of Hawaiian Home Lands aids beneficiaries with financial literacy services. HALE supports the department’s primary mission of placing beneficiaries into homes within Hawaiian Homestead communities throughout the State of Hawai’i. Currently HALE offers two types of services for beneficiaries. They include Homebuyer Education classes and Foreclosure Prevention Management. 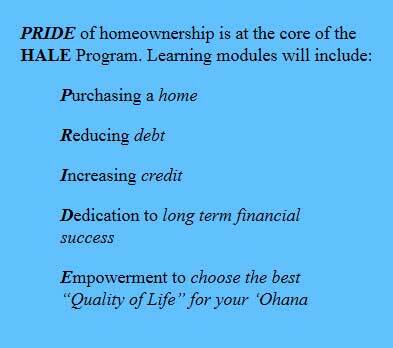 HALE’s purpose begins with PRIDE of homeownership. Becoming a homeowner is a big step for anyone and will probably be the biggest commitment you will ever make in your lifetime. HALE can help to get you started on the path to homeownership. HALE services also support beneficiaries in times of need. We all encounter life events that may negatively affect our financial situation such as unemployment, increased expenses due to the loss of a household member, an unexpected medical situation and other events. Eventually this may affect your ability to pay your mortgage and we encourage you to contact us immediately. We will do our best to assist you through a difficult time.